Okay, so back to banana ice cream. I’ve mentioned this in a post before, but just in case someone missed it I thought it was important enough to dedicate an entire post to it today. 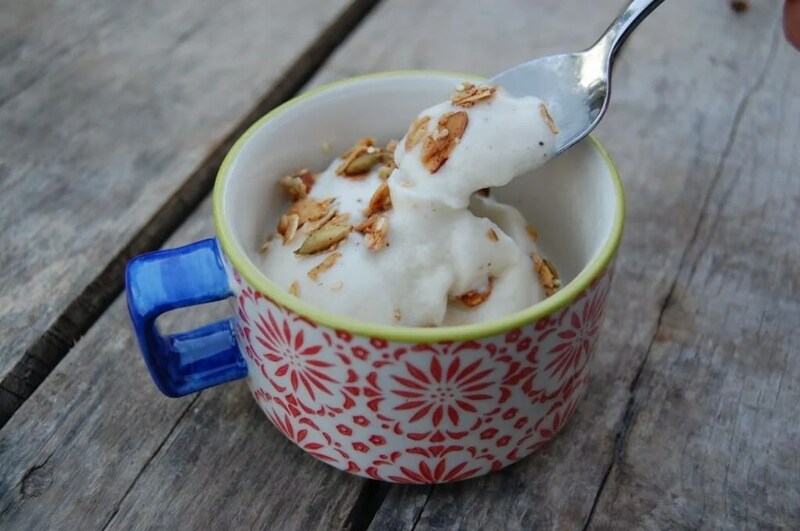 This recipe somehow magically turns regular old bananas into delicious, creamy, cold, banana flavored ice cream without using any cream or an ice cream maker. I love it because it is good, good for you, incredibly simple to make, and (my new favorite reason) cheap!! I would venture to say that bananas are the cheapest fruit available in any grocery store…so bring it on! Peel the bananas, break them into thirds, enclose them into a Tupperwear container, and stick them in the freezer overnight (or longer). I usually throw bananas in the freezer whenever they are about to go bad, and I’ve left them in there for weeks before so there is no rush. We used to eat something like this on the small farm we had when I was a kid. I haven’t thought of it in years. We added a tiny bit of vanilla and we used whole milk because that was what was delivered… It gave it a yummy creaminess. Oh, and we had to hand mash it so it had a “chunky” quality. It was always worth the work on a summer day. Mmmmm..vanilla would be a great addition too. Thanks for sharing!